In June we bought two bird houses at the hardware store. For weeks they sat on the floor by our garage door. Ever the procrastinator but sick of seeing them in the front hall, I ordered Amy and I outside and we impulsively hammered one to a spruce tree outside of our bedroom window. Within a day we noticed a tiny brown wren surveying the ground for small twigs (of course, pointedly ignoring the dryer lint strips and twine that Amy had thoughtfully laid out); over the next several days we watched him countless times fly into the entrance hole with a twig twice his length, maneuvering patiently to figure out just the right angle to get in. This went on for weeks, sometimes the male alone, sometimes the male and female, tirelessly scouring the ground for twigs and weeds and grass for bedding. We'd wake to the conversational chirping and be stupidly sad at dusk when it was over for the day. We were out of town when the babies hatched and the family departed, and we were very disappointed that we'd missed the going away party. The house hung unoccupied as summer raced on and cobwebs and earwigs commenced a second-wave occupation. We didn't know whether to clean the house or to wait until next spring; today we decided to empty it. All along I'd been eager to see the inside. The front door was latched shut, and I wanted my adolescent X-ray specs to take me behind—I wasn't expecting a living room set with TV for dad and mom wren and the little ones, but I wanted to see what kind of home was lurking behind that closed door, what arrangement of twigs supported a family in the natural world. Gaston Bachelard, in The Poetics Of Space: "It is striking that even in our homes, where there is light, our consciousness of well-being should call for comparison with animals in their shelters." When I was a kid walking past houses along Amherst Avenue on my way home from school, or past homes during my weekly allowance walk, I fantasized, as all kids do, about the lives inside, overwhelmed by the fact that what overwhelmed me inside my house was similarly overwhelming to a kid inside that house, a kind of existential physics problem that seemed improbable (impossible!) in the world, and yet it was true, in that house, and in that house, and that one.... (Bachelard again: "If we go deeper into the daydreams of nests, we soon encounter a paradox of sensibility. A nest—and this we understand right away—is a precarious thing, and yet it sets us to daydreaming of security.") (In the basement, with Lincoln Logs, in Barbie's Dream Home, in the tree house.) The arrangement of furniture in a stranger's home was somehow heartbreaking to me; as a kid I intuited that furniture purchasing and placement was a personal thing, that it revealed a family's aspirations and failings and embarrassments. When I was a kid it was always too close, someone else's home, with the family pictures on the wall, familiar but queer, with the odors as human as my own, someone startling me in his undershirt. I've written elsewhere about sleeping overnight at my friend Karl's house; he lived behind me, only thirty-or-so yards away, and yet tossing and turning next to him in his bed I felt anxious and desperately homesick. Half-asleep, I turned over in the unfamiliar bed and fell over the side, crashing onto the floor. His parents came rushing in. Their fealty, and perceived irritation, standing in their bed clothes, sleep in their eyes and on their lined faces, was too personal, too strange for me to bear. I'd trespassed on to something I couldn't name, and felt faintly sick about it. That was the end of sleepovers for me. "An empty nest found belatedly in the winter mocks the finder," Bachelard writes. A nest is a hiding place for winged creatures. How could it have remained invisible? Invisible from above, and yet far from the more dependable hiding-places on the ground? But since, in order to determine the shades of being, we must add a super-impression to it, here is a legend that carries the imagination of an invisible nest to its utmost point. 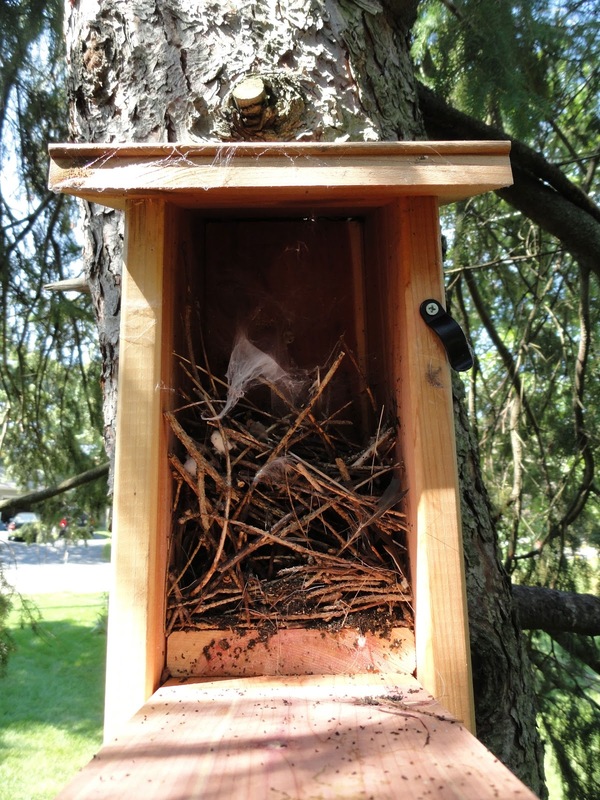 Our wren nest wasn't invisible, and it lacked the precariousness of a nest constructed in a tree (or so I imagine, convinced of the superiority of an inexpensive, man-made wooden box bought at Lowes). When it came time to clean the nest, I felt a surge of pride that we'd been able to provide, as it were. But the stability of the nail-secured wren house didn't discourage my daydreaming. What would we find? What's behind the door? Would it look personal, discomfiting like glimpses of a stranger's home? I wasn't prepared for abandonment. Why wasn't I expecting the wren-equivalent of an empty building? I've been drawn to abandoned buildings my whole life (here and here). I think that I associate abandonment with humans—which is absurd, given the brutal stories borne out in the natural world—and ghost-empty buildings with a negligence or social ennui at the indifferent hands of people with dreams and plans. Emptied hotels, boarded-up storefronts, a bock of abandoned row houses—this is the melancholy evidence of short-sighted men and women, pawns of economic or domestic naturalism, of cruel neglect of a past that once was full of promise and optimism. Animals don't subscribe to such romantic folly. 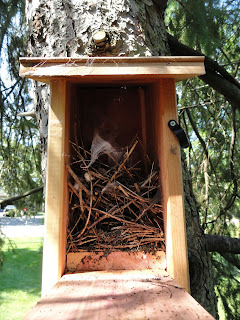 What we saw when we opened the nest door was simply that: abandonment. The sadness (precious and melodramatic) that I feel (and worse, cultivate) when I see an abandoned building was replaced in the tree by something else, something far more sobering than an arrested-future or an echoed past: instinct, necessity, the world's wheels spinning in complete indifference to what I might romantically make of it. Rightly so. I can't make up stories about the inside of the wren's nest; I don't speak the language of duty to the natural world. I arrest, suspend, fill in the blanks of a world simply being with stories that I simply make up. I was disappointed, I guess that's it: I wanted to see shreds of stories: I saw twigs; I wanted a kind of psychic environment broad enough to support my imagining: I got cobwebs; I wanted fantasies: I got feathers. The world, as always, has the last laugh.